We had some webmaster confusion on this boat. Hopefully, it's now straightened out. On December 29, 2010 she was Buck Owens' boat and on February 19, 2012 it was reported sold to Stepan Ludwig. Click here to go there. But, years ago she belonged to Arnold Sharpe and he kept her in Eureka, California. 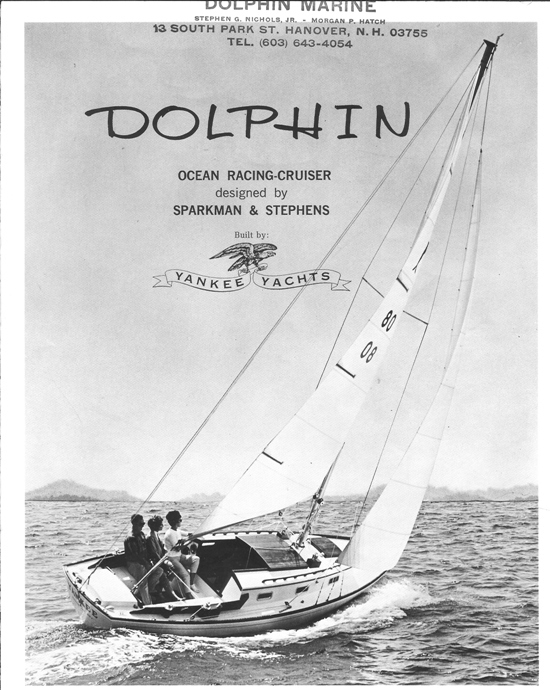 Yankee #80 was the photo boat on Yankee Yacht's 1967 sales brochure. Someday, we'll get some more history about this boat. Its available - we just have to figure out how to get it. Here is an excerpt of an October 9, 2010 email from Joe Sharpe, Arnold's son, on a trip they made to find another Dolphin to buy. The internet ad for the boat is (http://www.sailboatlistings.com/view/19565 Webmaster Note: November 28, 2012 ad expired). There are some problems with the image that make the hull look grey, which it's not.The current owner is asking $7500. If anyone is interested in a more thorough description I can give them one or email the video - at over eight minutes long, it's kind of huge.